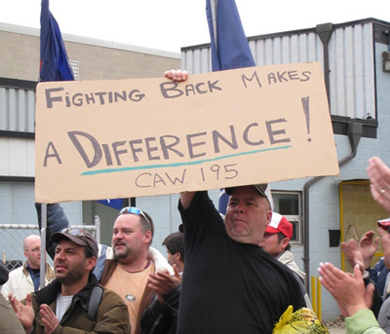 In the latest move, the Canadian Auto Workers (CAW) union agreed with General Motors to organize special early retirement buyouts at its two assembly plants in Oshawa, Ontario. This is designed to accelerate the automaker’s drive to replace higher-paid veteran workers with workers earning low wages. Temporary workers will get about $10 per hour less than their counterparts, receive an inferior benefits program, and be barred from enrolling in the pension plan. New hires will begin work at $14 per hour below the regular-tier rate, will receive reduced benefits, and also will be ineligible to participate in the pension plan. Some union leaders talk about confronting the threat of so-called ‘right to work’ laws (which would end compulsory deduction of union dues at pay source). Meanwhile they side-step the need to fight rollbacks in wages, benefits and pensions, and the insidious lower wage rate increasingly imposed on new hires. Such heinous measures undermine all workers’ (especially young workers’) confidence in unions. Is the 30 year pattern of retreat by Labour due primarily to an inherent lack of self-confidence, to ingrained passivity, or to false consciousness on the part of working people? Are unions no longer suited to their task, as some academic ‘Marxists’ argue? Or does a sense of powerlessness simply feed off bureaucrats’ self-inflicted failures? Does Labour’s retreat arise from an aversion to struggle by union officials? Plenty of evidence suggests that where a good, strong lead is offered, large numbers of people are willing to fight the austerity agenda of growing social inequality. The massive Quebec students’ uprising, the global Occupy protests, and the cross-Canada Idle No More movement testify to that. What’s lacking, especially at the top, is a will to fight, or even to allow the ranks to exercise the option. In the teachers’ unions we find a particularly egregious example of class collaboration, and the strangulation of rank and file initiative. Ontario English Catholic Teachers’ Association brass agreed to concessions before the Ontario Liberal government enacted Bill 115 (which suspended collective bargaining and the right to strike for education workers) – and did so without conducting a vote of OECTA members. Canadian Union of Public Employees-Ontario followed suit. Ontario Secondary School Teachers’ Federation tops mounted token protest rallies, and simultaneously negotiated local concessionary deals. In York and Niagara districts, members voted in November to reject the deals that mirrored provincial take aways, despite heavy pressure from Federation headquarters to accept. In February 2013, OSSTF suspended its ‘political action’ protest (chiefly the boycott of extra-curricular activities, which impacted mostly on students and parents), and in April capitulated to the province’s demands, with minor tweaks. ETFO, the last holdout, gave way on June 13. Discouraged by the unravelling of what began as a common front of resistence to austerity, education workers ratified the deals. But scandal dogs the leaders who did the dirty deeds. And members’ indignation pursues former OSSTF President Ken Coran. Coran angrily denounced the Liberals for violating collective bargaining rights, right up to the front door of the Liberal Party leadership convention in February. Then Coran stood as a Liberal candidate in the byelections held on August 1. Was his candidacy a reward for services rendered? As it turned out, Coran came a dismal, distant third in London West. The labour-based New Democratic Party surprised the pundits by winning that seat, and by making an even bigger breakthrough in Windsor-Tecumseh. The Conservatives captured Etobicoke-Lakeshore, and the Liberals retained Ottawa South, and Scarborough-Guildwood in Toronto. All five contested constituencies had been held by Liberal Cabinet Ministers. The loss of three is a serious blow to the scandal-plagued Liberal minority government at Queen’s Park, now reduced to 50 out of 107 seats, with Tories holding 37 and the NDP 20. Most observers expect the next Ontario-wide election will occur in Spring 2014. While perpetrating treachery from on high, union officials curtail democracy below. The latest attack is a ten year ban on this writer from attending OSSTF meetings for the crime of speaking out of turn at a substitute teachers’ bargaining unit meeting in November 2012. At the time, I demanded job access data that the local executive (consisting mainly of double-dipping retirees) refused to disclose for 10 years! The fact is that the teachers’ top brass, and most of the entire labour leadership, would rather suppress militant members than fight austerity-minded bosses. Bureaucrats put a premium on tight control — even if it means weakening workers’ resistence to an agenda that harms the vast majority, including ultimately themselves. In the Ontario Public Service Employees’ Union, rank and file members organized a large and inspiring Solidarity Caucus. Its mission: to get OPSEU to rejoin the Ontario Federation of Labour, to which it stopped paying dues without good reason. The caucus attracted much support. It helped to elect reformers to the union’s Executive Board, but it did not win the re-affiliation battle at the April 2013 OPSEU convention. The campaign continues. Meanwhile members of OSSTF and the Elementary Teachers’ Federation of Ontario formed a cross-union caucus, the Rank and file Education Workers of Toronto. REWT initiated actions to protest government policies, and is now demanding accountability from officials who approved funding and other forms of collaboration with the governing party which attacked teachers’ rights. And in the Toronto substitute teachers’ bargaining unit, the Action Caucus, which was launched in 2003 when local control was undemocratically usurped, has been increasingly successful at winning policy and action resolutions at unit meetings. It has come close to getting its candidates elected. The ten year ban reflects the bogus executive’s fear of losing control. The fight against capitalist austerity and union concessions requires rank and file organization in all the unions to promote mass job action to win a Workers’ Agenda. A Socialist International women’s conference in Copenhagen in 1910 launched International Women’s Day globally in 1911. 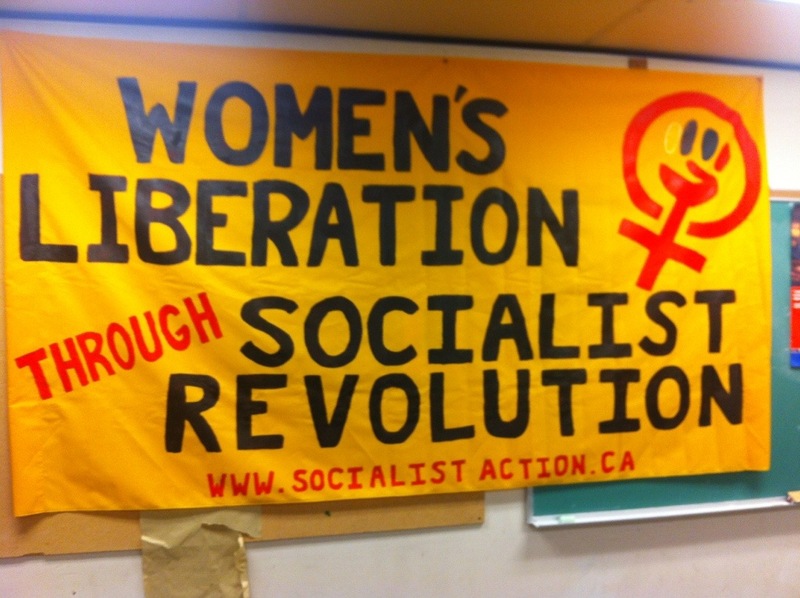 Trotskyist parties, including the predecessor organization of Socialist Action / Ligue pour l’Action socialiste in the Canadian state, re-launched the modern IWD in 1978. For good reason. Women’s oppression is rooted in the capitalist system. As with heterosexism, racism, environmental destruction and war, Capital profits from discrimination, dispossession and plunder. We march for bread, and for roses too. We do so in the face of escalating attacks on basic human needs – a vicious austerity drive linked to the global capitalist depression. Establishment claims that women have ‘achieved equality’ are nothing but a sick joke. The reality is…. On average, women are paid 30 per cent less than men. 27 per cent of employed women work fewer than 30 hours per week, more than double the 12 per cent of men who work part-time. 7 out of 10 part-time workers are female. Low paid women increasingly hold more than one job to survive. 56 per cent of multiple job holders are women. Canada is routinely condemned by United Nations bodies for its high rate of female poverty and the lack of social assistance for women. Aboriginal women and girls suffer shameful economic and social conditions. They are systemic victims of racism, inequality, physical assault, disappearance and murder. Most women still bear the double burden of the great bulk of domestic labour, as well as work outside the home. While trillions of dollars are wasted globally on corporate bail-outs and militarism, women and girls are denied adequate education, economic opportunities, clean water, health care, reproductive choice and personal security. From Palestine to Haiti, from Afghanistan to Colombia, women and children are disproportionately the casualties of wars and military occupation in which Ottawa is directly involved or complicit. No money for war. Imperialist hands off Mali and Syria. End all subsidies to Capital. Tax big business and the rich. Fund health care, education and social services. Establish a cross-country universal, free, quality child care system. Enforce equal pay and equal access to employment. Restore funding to women’s social justice organizations, emergency shelters and legal aid. Build quality social housing. Radically raise E.I. rates and provide real access for part-time workers. Phase-out the Alberta Tar Sands development. Conscript corporate profits to convert industry, business, homes and schools to green energy power. For public ownership of the commanding heights of the economy under workers’ and community control. For a Workers’ Government. No to any NDP coalition with the Liberal Party. Fight for working class political independence and for socialist policies in the unions and the NDP. Women’s liberation through Socialist Revolution. No socialism without women’s liberation. If you agree, join Socialist Action / Ligue pour l’Action socialiste today.